Boulder City’s long-standing Christmas tradition, Santa’s Electric Night Parade, will be held Saturday. 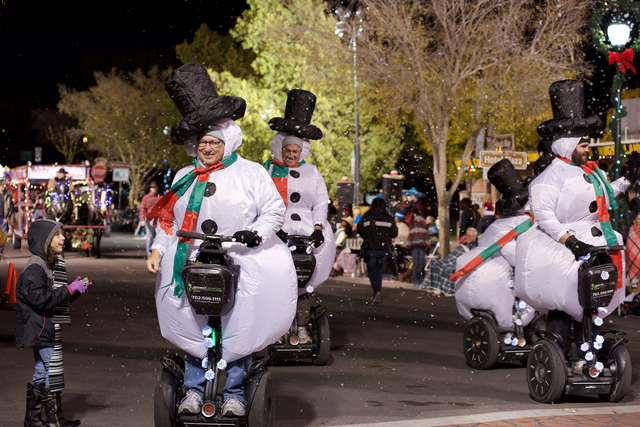 File A group of snowmen traded in their more traditional winter rides for Segways as part of Segway Las Vegas’s entry in last year’s Santa’s Electric Night Parade. This year’s parade start at 4:30 p.m. Saturday and travels along Nevada Way in downtown Boulder City. File Spectators line Nevada Way during last year’s Santa’s Electric Night Parade in Boulder City. This year’s parade starts at 4:30 p.m. Saturday. 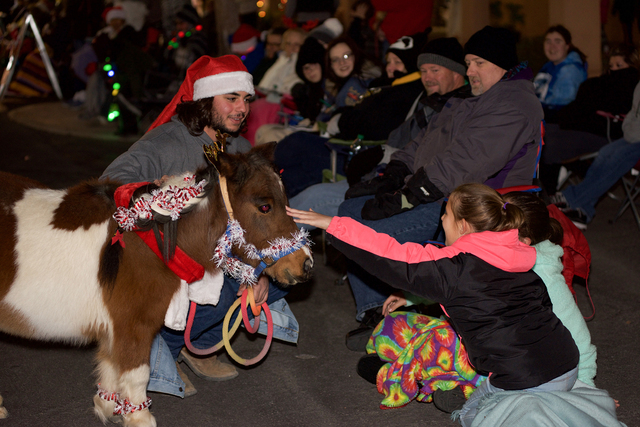 The parade is put on by the Boulder City Chamber of Commerce and features floats, bands, music, entertainment and a visit from special guests, Santa and Mrs. Claus. It is the capstone of the weekend’s Christmas celebration. This year’s parade also features more entries than last year’s. Rowland-Lagan said that there could be 98 entries, and last year there were 89. The parade begins at 4:30 p.m. on Nevada Way near Wilbur Square Park. It will travel down Nevada Way toward Fifth Street and then continue to Avenue B. Rowland-Lagan said that it will last approximately one hour, giving people time to head to Lake Mead for the Parade of Lights at 6:30. Each entry will be judged during the parade by category: individual adult, individual youth, religious organization, youth group, business, band/marching unit, community organization, motor/car group, dance unit, military/civil group, equestrian and family/club. Winners receive a certificate from the chamber as well as a gift certificate to a local chamber member business. Rowland-Lagan also hopes the weather for the event will not disappoint. “That can always make or break an outdoor event and good weather that day leads to a full day of fun activities and lots of happy little people with sugar plums dancing in their heads!” she said. Prior to Santa’s Electric Night Parade on Saturday are several other Christmas activities hosted by the chamber of commerce. The Christmas celebration for the weekend starts with tonight’s Luminaria and Las Posadas, Friday’s Christmas tree lighting at Frank Crowe Park, and Saturday’s Santa’s Picture Party from 11 a.m. to 2 p.m.